1836: A Texas Olive Company is a business venture born out of a 100-plus year history in Dimmit County, Texas. The dream of building an orchard began with a desire to pay homage to the L.R. Vasquez family and their decades of support to Asherton and its community. In 2012, the dream of a Texas olive orchard was launched into reality. 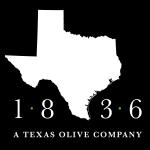 1836 believes in contributing to the Texas olive industry and in extending our family legacy in Texas.